Why is the PDF file so large? From the 2014 versions of MacStitch and WinStitch, the advanced PDF export produces large, high definition PDF files. The idea is that we maximise the detail when printing. For some people, this presents a problem because when opened on screen, the image is much large than the screen size, and they would prefer to see the ‘whole page at once’ rather than a portion. And you can apply margins at the same time. On the METADATA tab, there is now an option (QUALITY) to internally compress the images. This massively reduces the file size, which helps for web sites and emails. 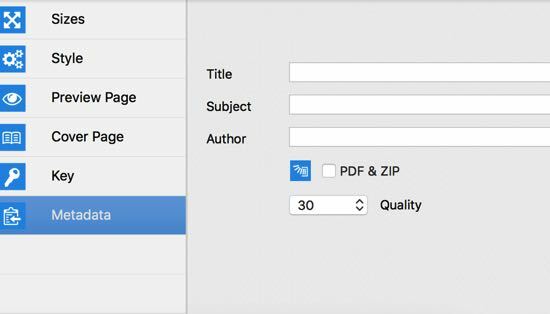 Depending upon the PDF viewer you are using, you can use a setting to ‘scale to fit’ for either on-screen viewing and especially for printing. 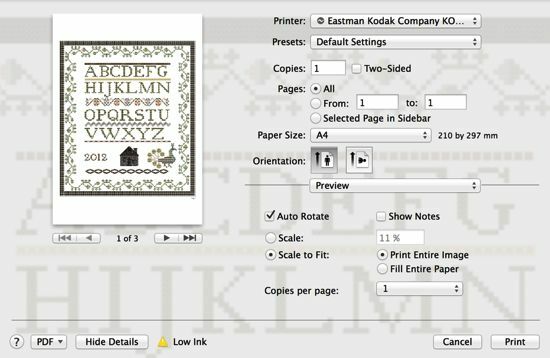 But if you are using a Mac, you can also use this technique to create A4 sized versions of the PDF files. The screen shot above is taken from ‘Preview’.. an OSX app. Click on the PDF button at the bottom left. 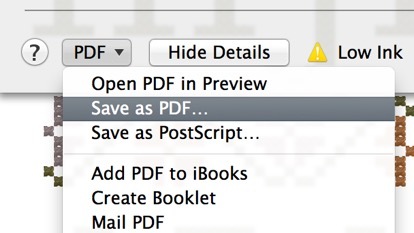 If you use ‘Save PDF’ , it will create a smaller PDF that is ‘normal sized’ for viewing on screen.